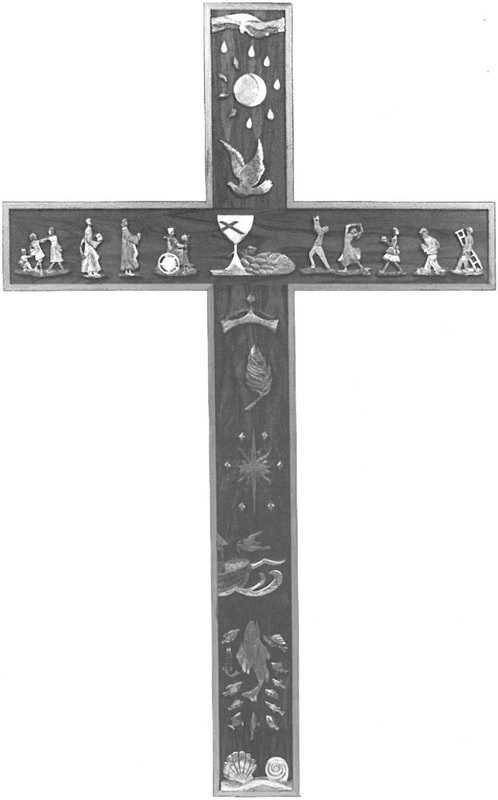 The Memorial Committee of Park Hill Christian Church in Kansas City, Missouri, commissioned Conchita Reyes in 1999, to design the "Celebration Cross" for the Narthex. The liturgical symbols were designed, hand carved and finished by the artist. Lighting designed by: Derek Porter Studio. Liturgical designs have been used through the ages to convey a belief or message. The "Celebration Cross" was designed to highlight significant religious thoughts and events to inspire people who come to the Church in celebration of their faith. The designs on the "Celebration Cross" incorporate familiar symbols with contemporary ones developed by the artist, Conchita Reyes. To understand the meaning of each of the symbols please read below. Baptism and Eternity. The scalloped Shell has long been one of the symbols of baptism; the Snail Shell is used by the artist to convey eternity. The Prophesy of Christ to Come. With the Fish symbol of faith, Christ is surrounded by the twelve disciples, each with his own personality. The Covenant and Promise. This symbol depicts the story of Noah and his covenant with God. The Star of the East. This Star announces the birth of Jesus and the celebration of His birth. Jesus' Triumphal Entry Into Jerusalem. The Palm leaf has long been the symbol for this story. King of Kings. Although some believed that Christ would be an actual king, the thorns remind us of the real Crown that He wore. The Lord's Table. These symbols remind us of the celebration at the table each Sunday. The Peace of God. The Dove is a symbol often used when we say "The peace of God be with you." Grief and Renewal. The Tears of Grief become the rain of renewal as they reach the sun and moon. Arms of the Cross: Represents those who celebrate and serve.